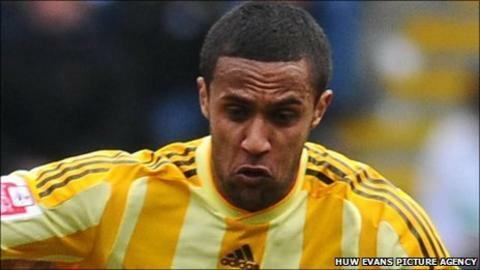 Winger Wayne Routledge has joined join Swansea City from Newcastle on a three-year deal. The 26-year-old complete his move to the Premier League newcomers after a medical. Newcastle accepted Swansea's undisclosed offer over a week ago, after rejecting an initial bid of £1.5m from the south Wales club. "I've had a good chat with the manager [Brendan Rodgers] and he really impressed me," said Routledge. "I had heard a lot of good things about him and the chat only reinforced my belief that moving to Swansea was the right thing to do. "It's taken a couple of days to get everything agreed, but I'm excited about getting started. "Having watched Swansea last season, I think everyone would agree that they were the best footballing side in the Championship. "It's going to be a difficult first season in the Premier League; it's going to be tough. "But everyone is confident and looking forward to it. After all, playing in the Premier League is what you dream of. Rodgers is delighted to have secured his fifth summer signing and said of his new arrival: "He knows he is coming to a great club that suits his style perfectly,and he will add competition and quality to the squad. "Technically he is very strong, he turns with the ball and gets at people, which I love. "Tactically he is very good and he understands the game. He has played at a high level and has got experience in the Premier League." Another new Swan, Leroy Lita made his debut in the 2-0 pre-season friendlywin against Celtic at the Liberty Stadium on Wednesday with Routledge looking on. Routledge spent the second half of last season on loan at Championship side Queens Park Rangers, where he helped them win promotion to the Premier League. But the former England Under-21 international, who had two years remaining on his Newcastle contract, failed to agree personal terms on a permanent return to Loftus Road. Routledge had also been linked with a move to big-spending Championship club Leicester City and Nottingham Forest. He was loaned to QPR in January - only a year after leaving Loftus Road to join Newcastle for an undisclosed fee - and scored five goals in 20 appearances as he played a significant part in Rangers' march towards the Championship title last season. Swansea, who beat Reading 4-2 to seal top-flight promotion in a thrilling Championship play-off in May, have already added striker Danny Graham, defender Stephen Caulker and goalkeeper Jose Moreira to their squad. The focus for Swansea now turns to signing a goalkeeper and a central defender before the transfer window closes on 31 August. Nottingham Forest rejected an improved offer for goalkeeper Lee Camp in midweek, and the Swans say they are beginning to give up hope of signing the Northern Ireland international. Swansea ended their recent week-long training camp in Austria with a 1-0 defeat against the United Arab Emirates Olympic team. Trialist goalkeeper Gerhard Tremmel, recently released by Salzburg, played the first hour before being replaced by David Cornell.